Facets are categories that can be assigned to data fields in the Search configuration in applications. In the browser, users have the option to use facets when searching and thus restrict the results shown. 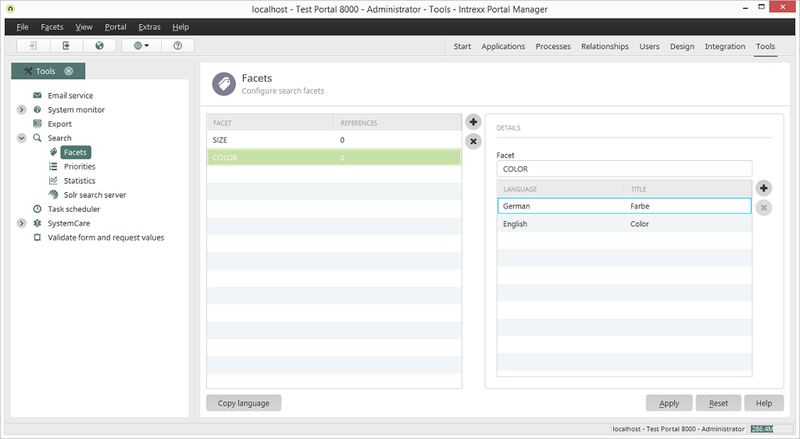 The ID of every facet created in search configurations in applications is listed here. You can see the number of search configurations where the facet is used here. Creates a new line where a new facet can be entered. Deletes the currently selected facet from the list. Opens a dialog where the title of the facets can be copied from the source language to a target language. The ID of the currently selected facet is shown here. This can also modified. Please note that the assignment of the facets in the applications' search configurations will be discarded when the Facet ID is modified. All of the portal languages are listed here. The value of the facet can be edited by double-clicking in the corresponding cell. This value, or rather title, is used in the search with facets depending on the language settings of the user. Opens a dialog where a new language can be selected. Removes a language from the list.